Nikki Jackson May 17 May 17 No Comments. Many people understand the benefits of training video programs for learning and training purposes. With today’s technology a training video can be viewed from any location at any time. If an employee is working from a remote location or has some down time between tasks a video can be easily viewed from a computer, laptop, tablet or phone. The custom content, training tip or targeted message can be delivered with ease and viewed at the appropriate time. There are some companies hesitant to take advantage of all the benefits that training videos and video messaging have to offer. One of the reasons is that a video project can seem daunting, especially if you don’t have experience in going through the process or you were involved in large scale video creation in the past. Creating a training video with a simple targeted training point or message can be very easy to do at very reasonable rates. Every organization, regardless of size, can come up with some basic training tips and safety concepts that they would like their employees to have. Re-creating these concepts with every new employee or giving refresher tips throughout the year is costly and can be monotonous. Enter the one one-minute wonder! A simple concept can be created and relayed to any and all employees in a :60-:90 second video in a short time at an inexpensive cost. Once these training videos and safety videos are made they live in the archives for as long as they are relevant to your company. They can be created over a period of time and a video library can be built ensuring your employees get the training and safety points they need at a fraction of the cost of holding refresher courses and seminars. 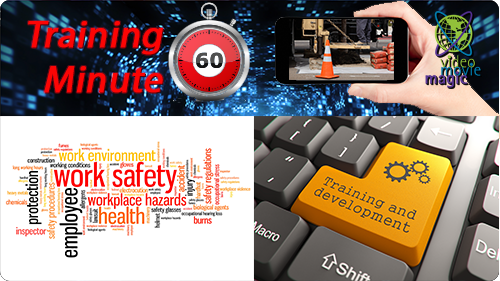 The short and long-term benefits of creating these video archives of training and safety tips are beneficial in terms of both employee efficiency and the corporate bottom line.